DONETSK, Ukraine -- A local reporter working for Agence France-Presse (AFP) covering the war in eastern Ukraine was injured in the leg by shrapnel on Sunday in the separatists' de facto capital Donetsk. 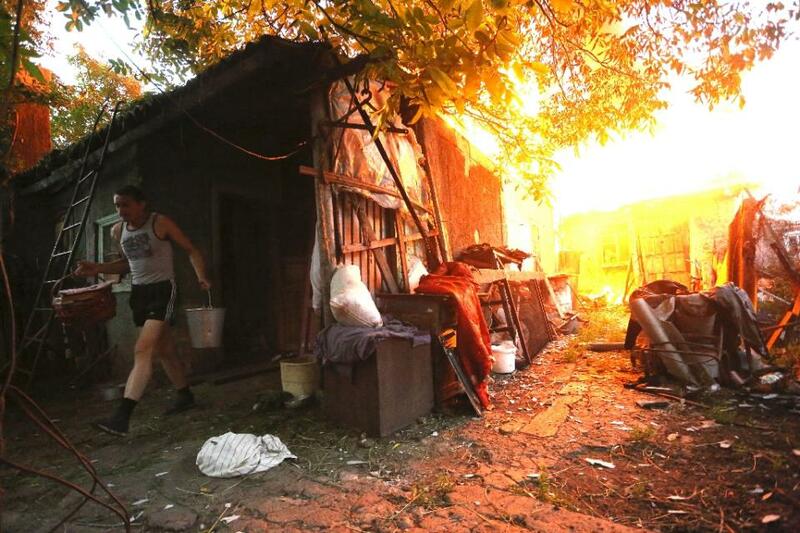 A resident carries out his belongings to save them from the fire after shelling between Ukrainan forces and pro-Russian separatists on the outskirts of Donetsk on June 9, 2015. Alexander Gayuk, 33, said he was "wounded in the knee, probably by shrapnel" during another round of intense shelling in the biggest city in the war zone. The video and photo journalist, who has covered the 14-month conflict extensively and lives in eastern Ukraine, said he was checked out of hospital after receiving 12 stitches and has been advised to rest for a few days. Both Kiev and rebel military sources reported escalating mortar and artillery fire in areas neighbouring the shattered remains of the city's main airport, which the pro-Russian insurgents seized in January. Ukrainian President Petro Poroshenko has since vowed to retake the airport in the future, getting reproached for his comments by US Secretary of State John Kerry. The warring sides had agreed to a new ceasefire agreement in February designed to give the separatists more independence within a unified Ukraine. But European-mediated political talks aimed at finding a definitive solution by the end of the year have been deadlocked, and heavy warfare has resumed. Some 50 people have already died this month, including one Ukrainian soldier reported killed on Sunday, as fighting engulfed previously quiet eastern regions of the former Soviet state. Western monitors said the clashes came after both sides pulled their heaviest guns up to the truce line in apparent preparation for a hot summer campaign.